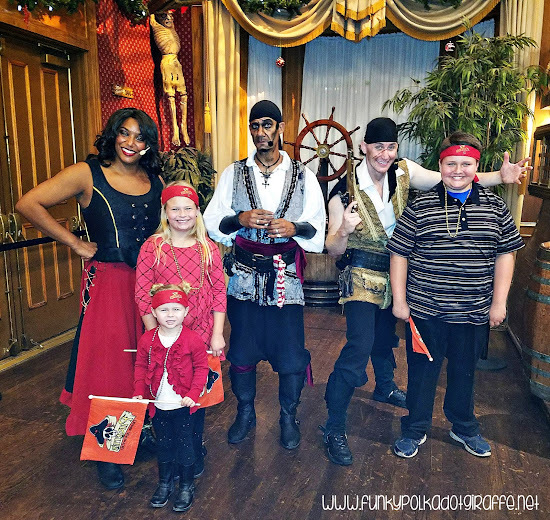 Disclosure: We attended Pirate's Dinner Adventure as guests for review purposes. All opinions are our own. Christmas has come to Pirate's Dinner Adventure!! In this fun holiday show the scoundrel pirates have captured Santa and Mrs. Claus! This threatens to end the holiday season and disappoint all the good girls and boys of the world. Santa needs you and your family and some holiday magic to defeat the pirates and save Christmas!!! Just like the original show, Pirates Take Christmas! is a two-hour live performance that features special-effects, aerial artistry, swashbuckling swordplay and duels! When you arrive and check in you are assigned your pirate and seats. 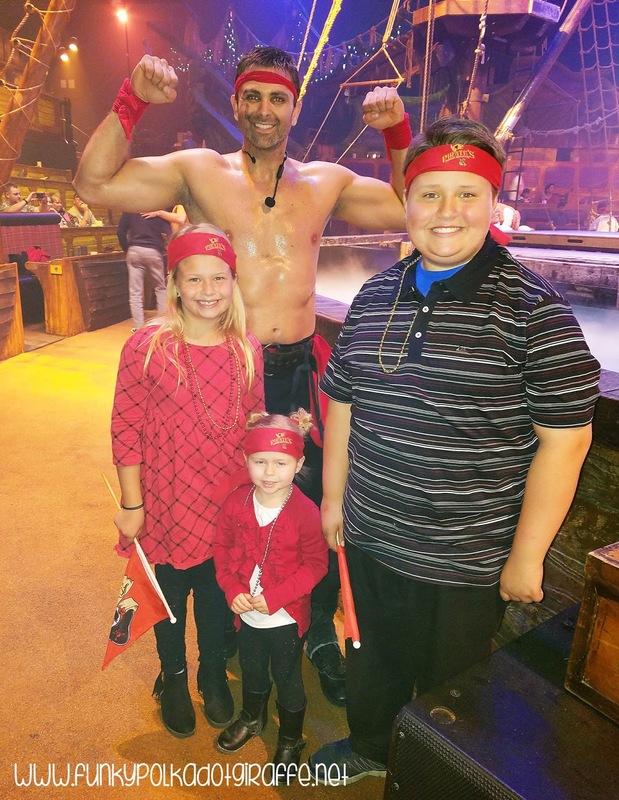 We were all excited to be team RED PIRATE because we were all dressed in red for the Christmas show! Check-in starts an hour and a half before the show on weekdays and two hours before the show on weekends. We went on a weeknight and I really enjoyed how it wasn't as packed as the weekend shows. So my tip for avoiding the crowds is to go on a weeknight! Treasure Bay Theatre is comprised of tiered seating for up to 700 guests. Anchored in the indoor lagoon is an authentically replicated and fully rigged 18th-century Spanish galleon under night sky lighting, measuring 46 feet long and 18 feet wide with 40-foot masts afloat upon 300,000 gallons of water. During this exciting show, you’ll dine from the deck of one of six ships surrounding the galleon.Your pirate will get you all pumped up for the pirate games - be sure to cheer loud! And if you're lucky, you might even get to be part of the show! Then comes the food! We we started with our choice of soup or salad. The adult meal is served up with roasted quarter chicken thigh. 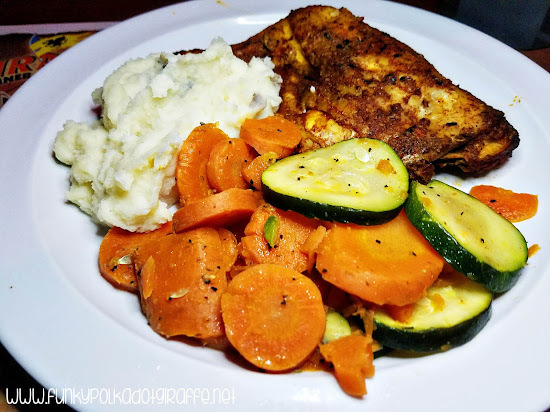 We were also served a shrimp and veggie skewer, mashed potatoes, and a delicious mixed vegetable medley. There are also Pepsi products (free refills), water, and lemonade to drink. Vegetarian and gluten free options available. 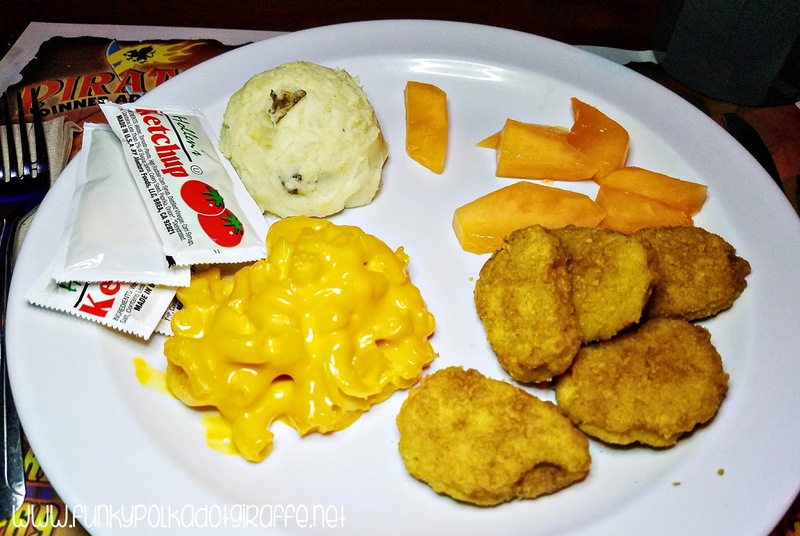 The kids were thrilled with the children's meal. There were all the favorites - chicken nuggets, mac and cheese, mashed potatoes and fruit. They were all thrilled to have bottomless Sierra Mist to drink. We all loved the dessert! 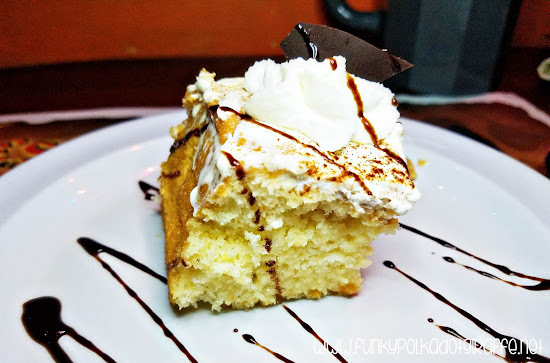 It was a yummy cake topped with whip cream and drizzled with chocolate sauce. 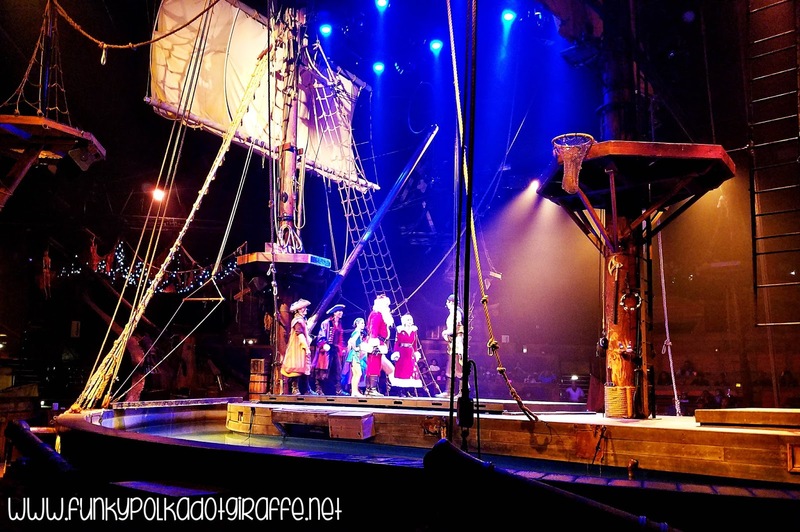 We've seen all the dinner shows at Pirate's Dinner Adventure and I think that Pirates Take Christmas! is my favorite yet! Christmas is such a magical time of year and I loved the holiday music, the lights, and the Christmas theme. It was fun to have Santa, Mrs. Claus, and their elf in the show. I also felt it was perfect for the whole family and we all enjoyed the show immensely. 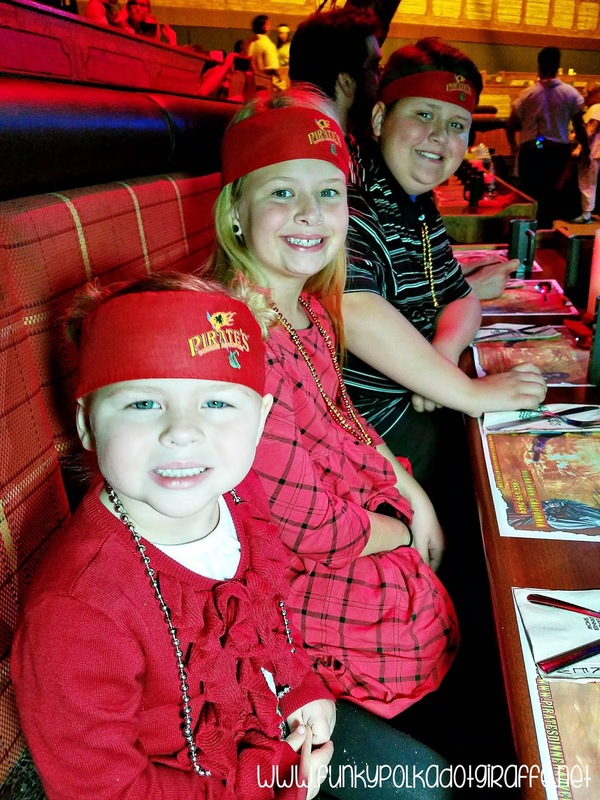 Pirates Take Christmas! is playing now through December 25th and you don't want to miss it! My readers get a special discount with the code POLKADOTXMAS - Buy One, Get One Free! Orders must be made over the phone at (866)439-2469. Mention code POLKADOTXMAS​​. Offer valid for general admission only. Not valid with any other promotion, discount, or group reservation. Tax and fees not included. Gratuity not included and will be charged for parties of 10 or more. Subject to availability. Reservations required. Discount valid through 12/30/17. 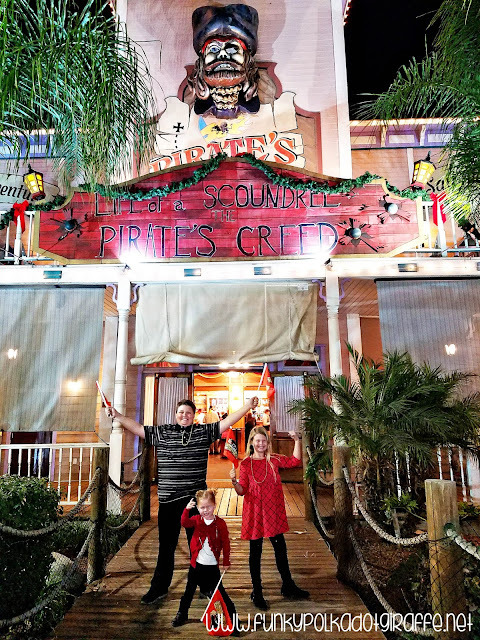 Pirate's Dinner Adventure in Buena Park is conveniently located off the 5 and 91 freeways - just down the street from Knott's Berry Farm! Complimentary on-site bus, car and handicapped parking. The showtimes are different depending on the day of week, so be sure to check out the Pirate's Dinner Adventure calendar for booking details.